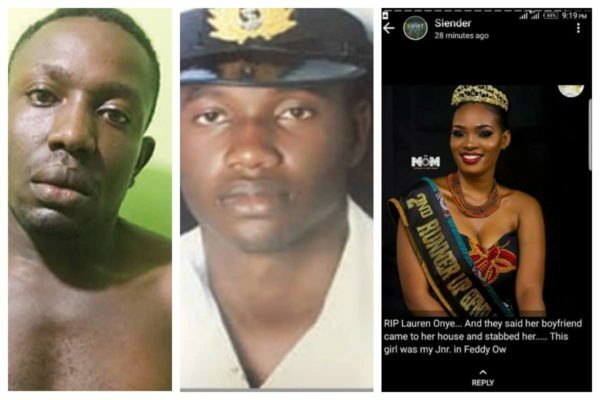 Raphael Jaja, the houseboy of a naval officer, Lieutenant Abubakar Yusuf, 35, has revealed why and how he killed him and his girlfriend, Lorraine Onye, a 300 level student. Initial reports had it that the naval officer killed his lover and fled, until recently when a discreet investigation unraveled the mystery behind the crime after detectives traced Yusuf’s mobile phone to Jaja’s friend in Port Harcourt. In an interview with Punchng, the native of the Opobo-Nkoro LGA, Rivers State, said: “I started working with my boss in 2016. He promised to pay me N15,000 monthly and that he would pay all my money before my marriage slated for December 2017. While I was preparing for my wedding, I asked him to give me N400,000; he said he had no money. I eventually borrowed N320,000 to do the wedding. In January 2018, I went back to him to ask for my money to take care of my family and establish my own business, he said he did not send me to go and marry. I began to plan his murder in April 2018 when he returned from Abuja with a new Hyundai Veloster. On May 3, I went to his house and I met only his girlfriend. I asked her to tell me about her relationship with my boss. She told me that she and my boss were supposed to travel to Canada in 2017, but they couldn’t make it. She said he bought her a phone and gave her N300,000 to rent a house. I was annoyed as she was saying all these. I persuaded her to tell me his ATM card password and she did. I killed her afterwards and hid her corpse somewhere in the room. My boss did not suspect anything when he returned from work and I killed him too around 4am. I wore his uniform and drove him in his car out of the barracks to a village called Apani, where I set his corpse ablaze. I drove the car to Benin, Edo State, where I sold it to one Alhaji for N1.9m.